This two-piece layering set by 10 Crosby Derek Lam has quickly become a favorite in my closet. The styling is essentially done for you, which makes for one easy outfit! I’ve worn the asymmetrical shirt (bottom layer) under a number of other things in my closet too. So multifunctional! 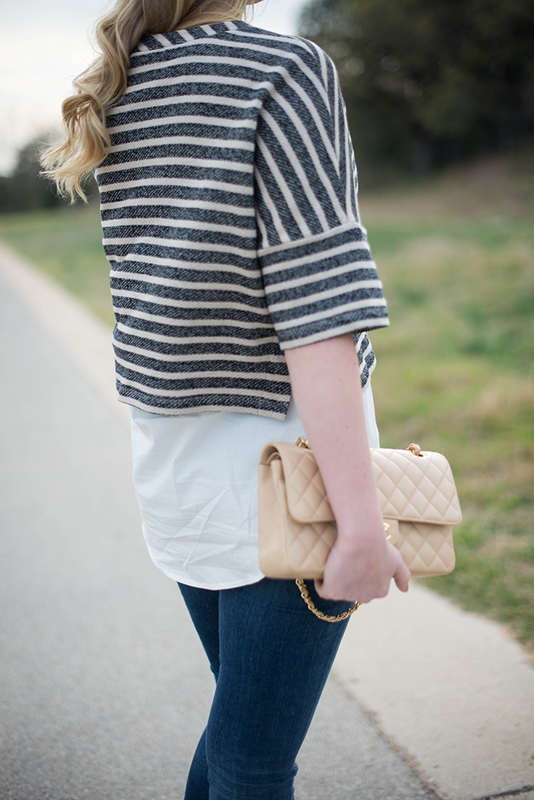 I wore this outfit to movie night with my family while in Austin this week – we saw Divergent and it was awesome. I haven’t read the books, but now I’m dying to! Another comfy casual piece I’ve been rocking lately are these skinny jeans by Citizens of Humanity. They’re the perfect spring wash, in my humble opinion. When I’m not wearing heels I like to wear cute flats at the very least, and this Kate Spade bow-adorned pair is glorious. The gold heel sold me. What are your go-to items for a casual weekend look? 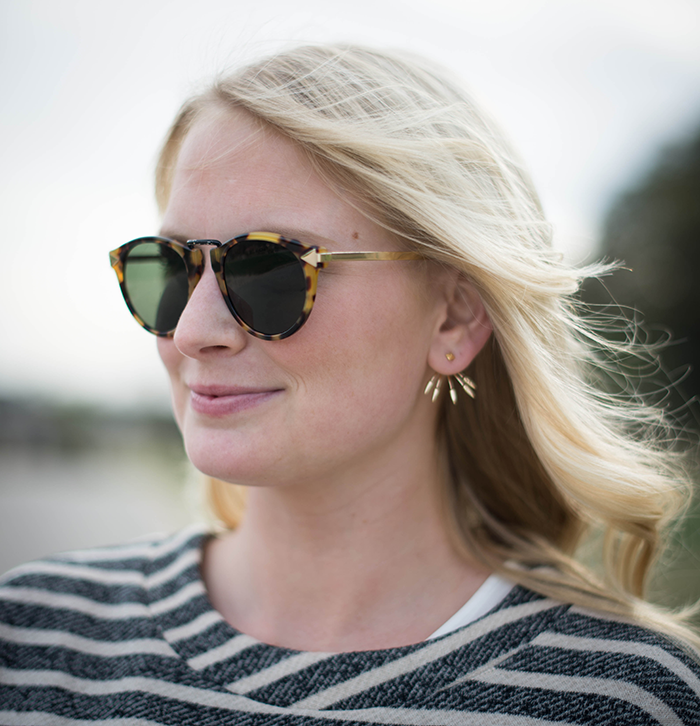 Don’t forget to enter the Kendra Scott LUXE giveaway. Deadline for entries is today at 5pm CST! Click here for details and to enter. PS: head over to Hello Girl Blog to see where I’m shopping these days, along with other great Dallas bloggers! I haven’t seen this layering set before…but it’s really cute…really very different.. This top is so awesome, you look so cute. Love those flats as well. A great casual look! Now you’ve made me curious about Divergent. My husband went to see it and loved it, but I hate going to the movies and thought I would hate it. Love that top layering piece. So unique. I wanted to see Divergent. Hopefully this weekend I will. I am obsessed with this top now!! Such a great weekend look! Love how you layered these pieces! And loving those flats too:) Have a great weekend! 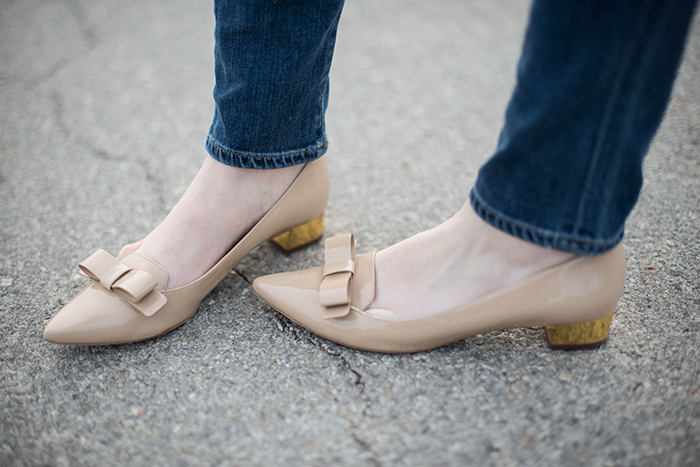 Those Kate Spade bow flats are so charming! 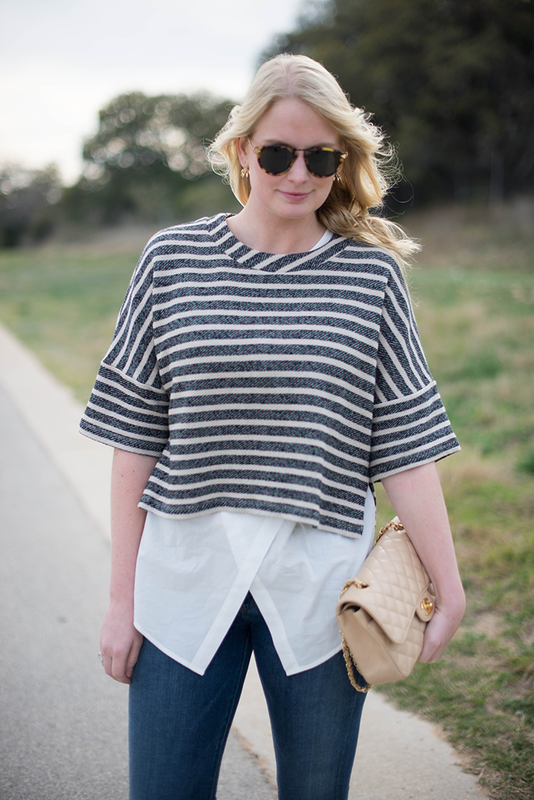 I always love a striped look….crisp and fresh for spring! Love the layered top! Perfect outfit for the weekend! 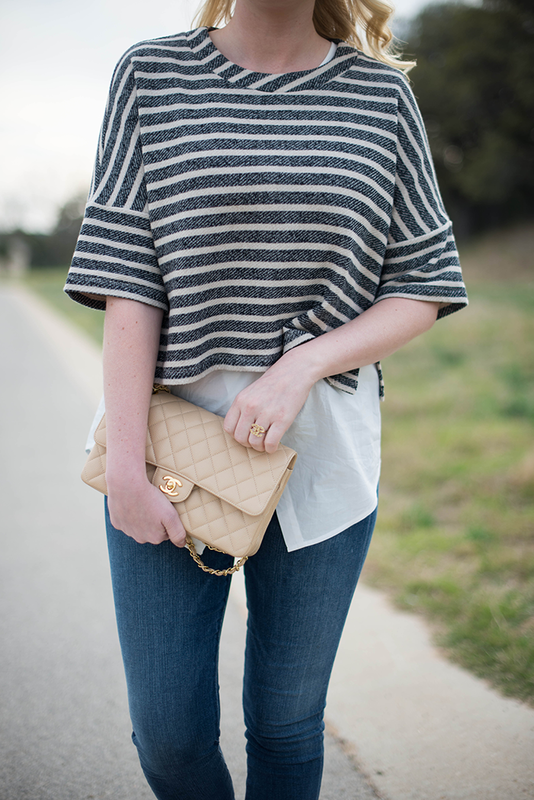 Love that striped top and the layered look. Very pretty! What a fun top! I’m completely swooning over those shoes too! I love that top (especially the bottom layer!). It is great that you can wear the two pieces separately! Love that layering combo! Such a great shape. I love the layered look of that Derek Lam top, and so great that you can also wear the pieces as separates. I went and saw Divergent this past week also, and loved it!! Afterword I went right to the book store and picked up the next book in the series, I am about 100 pages into and totally enthralled, nothing like reading a young adult novel haha..! i love how you layered this outfit!! Love the layered top! At first glance I thought you had layered pieces. Great casual look! Thanks for stopping by my blog! I want every piece from this outfit! Especially those jeans and that two-piece top, currently in my shopping cart! Loving your layered look! Cheers to the weekend lady! What an awesome look! I love the sweater by itself, and over the asymmetrical skirt ends it’s so pretty. Cute shoes & sunnies! I love them both! 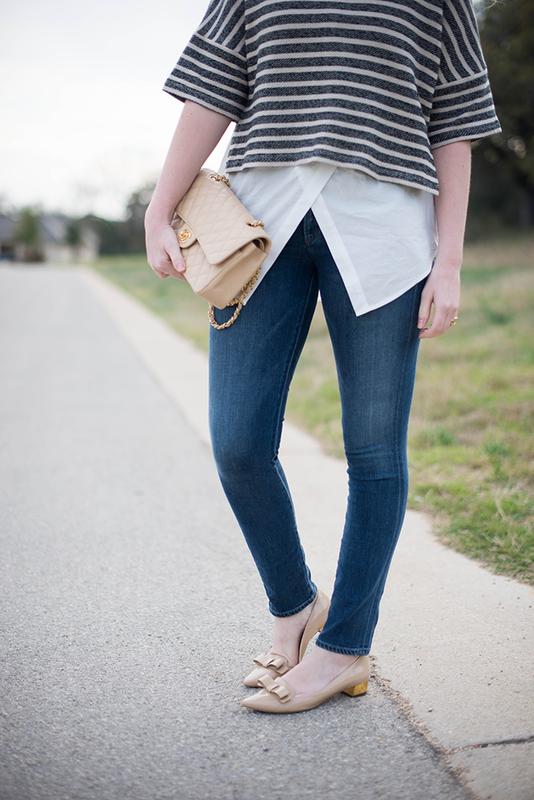 I LOVE the layered tops- they make the perfect shape and the bow shoes are amazing! love that top – super chic and the flats are super cute! Cute and comfy! Love the shoes too! love everything! That top is so perfect! Those shoes and that bag are perfection! Love the neutral color palette. I love your sunglasses !!! I really like the shape of that top too it is really different being cropped yet boxy and having the longer sleeves, such a cool look !!! fabulous!!! great outfit…all my favorite things paired together. Completely obsessed with this whole outfit, especially the top! I love how it’s two separate pieces – it seems more “authentic” that way! Oh, and those earrings are pretty fabulous as well!